Bees are commonly feared for their random appearances and occasional aggressive behavior. Their stings are well known to be painful, but they usually happen because they feel threatened. Today we will give you some advice about what to do if you come across them. Actions such as screaming, swatting, or running away from bees are guaranteed to make them feel threatened. The saying “they are more afraid of you than you are of them” is true for them. They commonly come near people because of the fragrance they are wearing and tend to only stay near for a few moments; avoid swatting at them and you won’t get stung. Stay calm, and slowly walk away if you encounter bees. People commonly find bee hives in trees or other areas near their home or business. Attempting to remove them will only lead to a painful attack, while endangering anyone nearby. Pets are curious about most things that are going on around them. 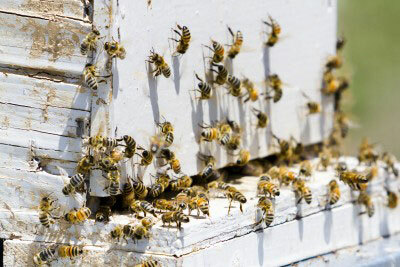 Keep them inside if you notice a hive or any heavy bee traffic around your home. It is important for everyone to report bee hives and swarms immediately when they are found near buildings, at parks, on hiking trails, or homes to help keep others safe. Bee populations are rapidly decreasing across the world: it is our mission to safely remove them from unwanted areas and release them into environments where they are welcome. Contact We Save Bees for humane bee removal if you notice a hive near your home or business. It is our goal to make Live Bee Removal affordable for residential and commercial customers, and to ensure that our customer service is outstanding. Our rates are based on the location and type of work required to complete the job correctly. 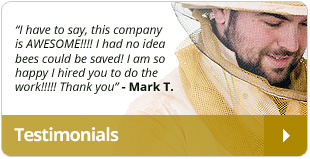 We do not and will not Up-Charge for Live Bee Removal because that is all we do.